Currently India is witnessing poor economic condition so the reality market of India is. It is estimated that nearly 6.5 lakh home in country are lying ideal waiting for buyer. This situation may force builder to cut price & offer discount to prospective buyer. There are indications that reality bubble will finally burst. 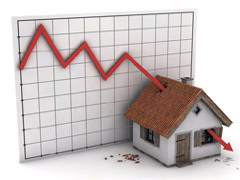 Many regions like Hydrabad, Kolkata, NCR, Gurgoan has already observed price fall in real estate price. If you are planning to buy home we recommend to wait till Diwali, Majority of builders are under extreme pressure and willing to cut down margin or started offering benefits like free parking place or preferential locations. Real estate is historically believed as safest investment and in past real estate has given good returns, but from last one year or so real estate market has started a declining. NHB residex shows that 24 cities has observed decline in past one quarter in reality prices. 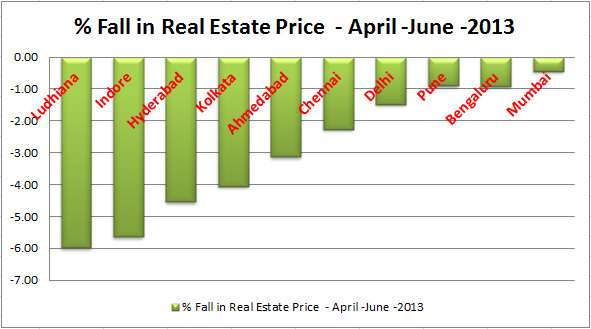 We are herewith 10 real estate destination of India where price fall is observed in last quarter. Highest price fall is observed in Ludhiana (5.98%) & Indore (5.6%) followed by Hyderabad (4.55%) & Kolkata (4.06%). Other major cities where price fall is observed are Ahmedabad (3.12%) , Chennai (2.26%), Delhi (1.48%) ,Pune(0.9%), Banglore (1%) and Mumbai (0.5%). So if you are planning to invest money in real estate better investment destination today are Mumbai, Banglore, Pune and Delhi. Note:- This Data is gathered from NHB Residex. Do share it with your friends! Don’t forget to add your views in comment section. completely agreed with this article .. i live in mumbai where the prices are unreasonably high .. 1cr is going on for a 1 BHK flat in kandivali, malad area.. whereas the earnings of the common man have not gone up drastically .. i think in a years time this bubble will burst and people will wake up ..